Stormossen provides waste management to individuals and companies in Ostrobothnia at their 12 plants in the region. Handling garbage from gardens, construction sites, individuals and special waste there are about 100 000 visits per year. Payment with cash or credit card proved to be time consuming and inefficient. Also they were lacking ways to gather information about the consumer behaviour or monitor the operations. There was also a threat of misuse. With UPC Center providing the concept, UpCode implemented and delivered a point of sale system. With personal ID, private and corporate customers would now use customer cards to access the waste management service. 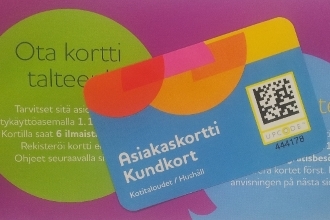 Stormossen set out customer cards produced by UPC Print with unique 2D codes printed on them. With the start of 1.1.2014, all 60 000+ customers will use the customer card for identification and payment when visiting a plant. The worker at the plant scans the code on the card with a mobile phone. The system keeps track of visits and type of visit in real time. Transaction data is stored for each visit. The card also serves as a information channel between the company and their customer. Stormossen can at any time relay messages that the customer will see at the event of the code being scanned. No need for new infrastructure or special devices. UpCode also offered a comprehensive solution that included planning, development, implementation and even production of cards. More time for clients – more time for efficient waste disposal. No money handling on site – no mistakes. Everything is monitored – accurate reports – bigger incomes. Fair pricing for everyone. Mobile information and services for the end customer via the code. Following the more rigorous process, corporate billing went up due to a closed loophole.